Built in the 1920s by the Bauhaus-inspired architect Robert Mallet-Stevens in Hyères in Southern France, Villa Noailles is a place of timeless modernity. Originally the home of art patrons Charles and Marie-Laure de Noailles, the villa welcomed artists such as Man Ray, Buñuel, Dalí, and Cocteau, who inspired and took inspiration from their hosts. Despite its incredible charm, the building was subsequently abandoned and slowly succumbed to the passage of time, only to be re-discovered in the early 1990s as a perfect symbol of interwar "modern." Karl Lagerfeld's graphic photographs of Villa Noailles, taken in the summer of 1995, were published in that year in the now collectible Steidl book Villa de Noailles. 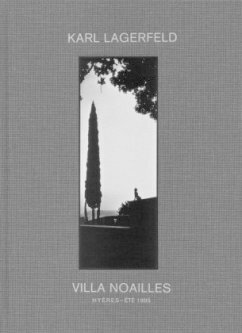 Now, two decades later, Lagerfeld has re-edited and updated his vision in this new book Villa Noailles, Hyères-Été 1995, which once again visualizes the villa's avant-garde architecture and its historical shadows. Karl Lagerfeld, fashion designer, publisher and book dealer, began working as a photographer in 1987. Lagerfeld has since received the Lucky Strike Design award from the Raymond Loewy Foundation, the cultural prize from the German Photographic society, and the ICP Trustees award from the International Center of Photography. Steidl has published most of Lagerfeld's books, including A Portrait of Dorian Gray (2004), Room Service (2006), The Beauty of Violence (2010) and the best-selling The Little Black Jacket (2012).